The theme music was written by Anthony James, composer and CEO of British company Music Candy, and his writing partner Yiorgos Bellapaisiotis, Music Candy's Director. Piers Morgan Live was broadcast primarily from CNN's studios at the Time Warner Center in New York City. Throughout the show's run, Morgan interviewed many guests, including politicians, celebrities and members of the public. His first guest was Oprah Winfrey. Soon after the show's debut, when the Egyptian revolution began, the show changed from a Larry King Live-like interview format to a breaking news-format program. Morgan had never anchored a live news show, but did have experience with breaking news as a newspaper journalist. Because of major news events such as the Arab Spring and the Japanese earthquake and tsunami, the ratio of taped to live interviews was the opposite of his expectations. After a respectable start on the debut show, and tripling the viewing figures of King's program, Piers Morgan Tonight had suffered from falling ratings. On his first show 2.1 million U.S. viewers tuned in, but by the second show the ratings dropped to 1.3 million. The January 28, 2011, edition garnered just 498,000 viewers. The show received its second largest audience on February 28, 2011, as 1.346 million people tuned in to see Morgan interview actor Charlie Sheen, whose recent abnormal behavior made headlines. However, by the autumn of 2011, the program's ratings were trending downward. In October 2011, Piers Morgan Tonight had an average total audience of 589,000 each night, down from Larry King Live's average of 657,000 in the same month a year before. In November 2011, the program had an average of just 154,000 viewers ages 25 to 54. In contrast, Larry King Live had an average of 161,000 in November 2010. Piers Morgan Tonight also had fewer total viewers that month than Larry King Live did a year before, 620,000 versus 635,000. In June 2012, it was reported that Piers Morgan Tonight had the lowest ratings for a CNN primetime slot in 21 years. During the week of July 30, 2012, to August 5, 2012, the program averaged 314,000 viewers overall, with a mere 81,000 in the 25 to 54 viewing demographic. That average was the lowest week Piers Morgan Tonight has had since its debut. Despite a fourth-quarter uptick around the 2012 U.S. presidential election, in January 2013 Mediabistro.com reported, "Compared to last year, Morgan’s program is down −19% in Total Viewers and −22% in the [age 25–54] demographic". The February 28, 2013 broadcast of the show received only 87,000 viewers in the key 25 to 54 viewing demographic; a yearly low. That month, the show was also down 27% in total viewers and 38% in the demo from its January 17, 2011 debut. 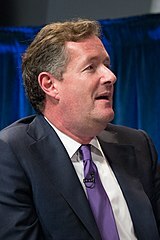 In June 2013, Piers Morgan Live garnered an average 121,000 viewers in the targeted demographic, its lowest-rated month since premiering in January 2011. Consequently, on February 23, 2014, with headlines like "CNN’s ‘Piers Morgan Live’ Ratings Sink To Second Lowest Ever, CNN Ties Sixth Worst Primetime Result" coming out in a steady trickle, it was announced that Piers Morgan Live would be cancelled. A March 2012 report at MTV.com claimed that "Morgan has apparently felt slighted over the years by Madonna ... he claims he was lied to by the singer's publicist", and that "Morgan escalated the feud, sending a snippy message to Madonna ... Morgan wrote, 'Welcome to Twitter @MadonnaMDNAday – you're still banned from my show. Love Piers.'" Morgan additionally banned Madonna's publicist Guy Oseary due to what he called "guilt by association". In September 2012, it was reported that Morgan had additionally banned actor Kelsey Grammer after Morgan claimed Grammer "saw a photo of his ex-wife Camille in the open to our show and legged it." On September 26, 2012, Fox 11 Los Angeles reported that "many say [it] was an ambush by Piers". The Huffington Post reported, "before the interview was scheduled, it was made clear that Grammer would answer all questions, including those about [his ex-wife]. His sole request was not to show any images of her." Morgan had also banned Hugh Grant from the show, calling him "a tedious little man". The show was aired in the United States and Canada on cable channel CNN and simulcast to the rest of the world via CNN International. ^ Stelter, Brian (December 16, 2010). "CNN Fills the Gap Between King and Morgan". The New York Times. Retrieved December 16, 2010. ^ Rajini Vaidyanathan, "Piers Morgan's debut as CNN host after Larry King", BBC News, January 18, 2011. ^ "CNN hires UK radio producer" Archived 2012-05-03 at the Wayback Machine, Radio Today, January 10, 2011. ^ "TCA: Oprah To Be First Guest on 'Piers Morgan Tonight'", Multichannel News, January 6, 2011. ^ a b "Eventful first year for Piers Morgan's CNN show". CTV. Associated Press. January 16, 2012. Retrieved January 17, 2012. ^ Morgan, Piers (January 16, 2012). "Chelsea Handler Turns the Table on Piers; Piers Morgan Discusses First Year With CNN". Piers Morgan Tonight (Interview). Interviewed by Chelsea Handler (guest interviewer). CNN. Retrieved January 17, 2012. ^ Sarah Gordon, "Piers Morgan Sees US Show Ratings Plummet", Sky News, January 31, 2011. ^ "Kardashians fail to score a hit for Piers Morgan as ratings are beaten by supermarket documentary", Mail Online, January 29, 2011. ^ Bill Gorman, "Crazy Charlie Sheen Gives 'Piers Morgan Tonight' Its 2nd Biggest Audience; Best 25–54 Demo Ever", TV by the Numbers, March 1, 2011. ^ Stelter, Brian (November 30, 2011). "Piers Morgan Struggles to Beat King's Ratings". The New York Times. ^ Amy Willis (June 28, 2012). "Piers Morgan brings worst ratings to CNN prime time slot in 21 years". Telegraph. London. Retrieved February 24, 2014. ^ Patten, Dominic. "CNN Primetime Ratings Sink To 20-Year Weekly Low". Deadline.com. Retrieved February 24, 2014. ^ Merrill Knox, "2012 Ratings: CNN Down for the Year, But Finishes 2012 With Strong Q4", MediaBistro.com, January 4, 2013. Retrieved January 29, 2013. ^ Amanda Kondolojy (March 1, 2013). "'Piers Morgan Tonight' Hits Yearly Low in 25-54 Demographic". Tvbythenumbers.zap2it.com. Retrieved February 2, 2014. ^ O'Connell, Michael (February 7, 2013). "TV Ratings: MSNBC Suffers Worst Quarter Since 2007, Piers Morgan Drops on CNN". Hollywoodreporter.com. Retrieved February 24, 2014. ^ "CNN's 'Piers Morgan Live' Ratings Sink To Second Lowest Ever, CNN Ties Sixth Worst Primetime Result". ^ Gil Kaufman, "Madonna Banned...", MTV.com, March 28, 2012. Retrieved September 30, 2012. ^ "Kelsey Grammer Walks Out on Piers Morgan", ABCNews, September 20, 2012. Retrieved September 30, 2012. ^ Emily Gagne, "Kelsey Grammer storms off set", TVGuide.ca, September 20, 2012. Retrieved September 30, 2012. ^ Official Facebook page: FOX 11 Flash, September 26, 2012. Retrieved September 30, 2012. ^ "Kelsey Grammer, Piers Morgan: Actor Barred From CNN Show But Not Concerned, Says Source", Huffington Post, September 27, 2012. Retrieved September 30, 2012. ^ "CNN: What time does Piers Morgan air in your country", CNN, January 18, 2011.